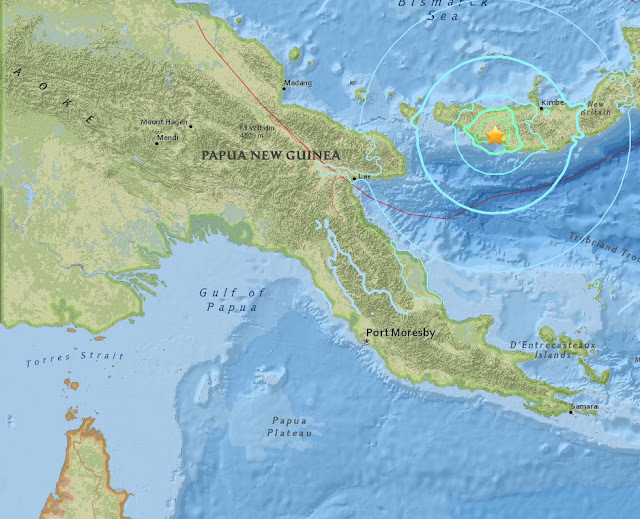 It was expected, it is even maybe a little late but a shallow magnitude 6.5 quake struck Papua New Guinea last night. Image..Earth is exiting a stream of solar wind flowing from the indicated coronal hole. Credit: NASA/SDO. Coronal Holes are the primary earthquake factor. We are looking for the dark patches, which indicate that the interplanetary magnetic fields connecting earth to sun may be about to experience significant fluctuations of energy. The massive coronal hole is now turning away from Earth bringing a huge change in pressure on the Earths tectonic plates. Yesterday's major quake was the is the first of March and the 13th of 2017.